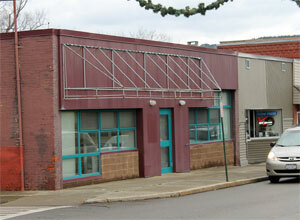 MONTOUR FALLS—Quinlan's Pharmacy is looking to purchase 336-338 West Main St. in Montour Falls to open a new pharmacy. Company representatives made the announcement at a press conference Thursday, Dec. 22. Village, county, and Schuyler County Partnership for Economic Development officials have been working to replace the Montour Pharmacy after it closed Dec. 6. This arrangement with Quinlan's is the result of those efforts. The building at 336-338 West Main St. used to house Schuyler Hospital administrative offices before they moved to the renovated Montour House. 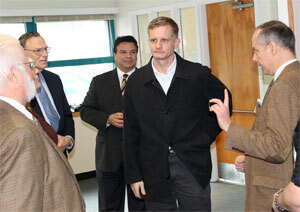 Jessica Pompeo, director of operations for Quinlan's Pharmacy and Medical Supply, said the plan is to open March 1. She said the pharmacy needs to get approval and licensing through the state to open a location in Montour Falls. There is also some work to be done to the 3,200 square foot structure. Pompeo said renovations to the inside will include knocking out a middle wall, along with new carpeting and painting. County Administrator Tim O'Hearn explained the property is owned by the county. The plan is to sell it to Quinlan's, putting it back on the taxroll. However, he said the sale has not been finalized yet. O'Hearn added Quinlan's has a "demonstrated history of community involvement." Pompeo said Quinlan's was started by Thomas Quinlan in 1986. John Quinlan, the founder's son, joined the business fulltime in 1996. The chain has stores in Wayland, Geneseo, and Canandaigua. Pompeo explained the Geneseo and Canandaigua locations only sell medical equipment; the only other Quinlan's Pharmacy is in Wayland. Pompeo added she has even worked at the Montour Pharmacy for five years before going to work for Quinlan. "I've seen Montour Falls at four o'clock in the morning," she said about opening up the pharmacy when it was owned by Henderson's Drug Store Inc. When asked about the possibility of adding a drive-through, Pompeo said it's something they could look at doing as the layout is still being designed. Pompeo added Quinlan's Pharmacy will offer some, non-pharmaceutical merchandise and would continue to provide local deliveries. "If we get in here quick enough it won't be hardship for people to come back," said Pompeo about pharmacy customers. In the closing of the Montour Pharmacy, CVS purchased the customers. Montour Falls board member Jim Ryan said a pharmacy within the village is needed to serve the residents who live in rural areas like Mecklenburg, Cayuta, or Alpine. He added, "It's truly a Christmas gift to the community."